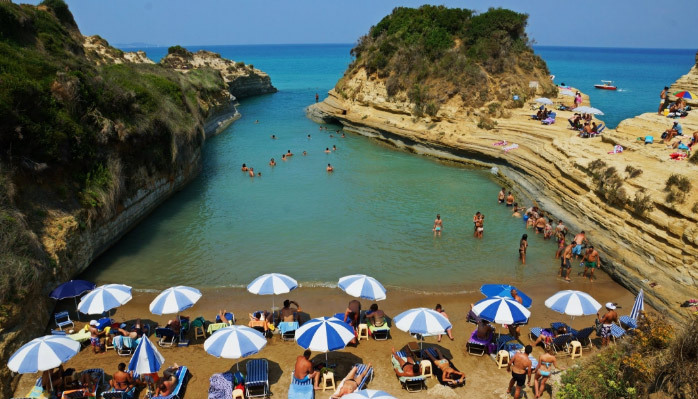 Sidari is a village placed in the North West part of Corfu island in a hill area. What makes Sidari a very famous tourist place is the particular Canal d’Amour, the Channel of Love. Sidari is a nice big town, developed on the sea that also offers more than one bay. Originally the villages were two and small, connected by a long beach. Year after year with new buildings these two villages become just one. Every summer a lot of English tourists come to Sidari for its young night life and for all the tourist facilities that this modern village offers. Sidari is a very big tourist town that has more than one bay. There are 3 most important beaches; one of those is the famous Canal D’amour. The other two beaches consist of a very long sandy bay and a smaller one very beautiful surrounded by stones shaped by the wind. This small bay is very particular and recess with lot of privacy. The Channel of Love (Canal d’Amour) of Sidari is a unique bay and you can find more information and photos about it inside our top 10. To reach this beach you just have to pass the village and proceed towards Peroulades. You’ll find on your right a small sign for the beach. Sidari is connected with Corfu old town, Roda and some others villages many times every day by the local bus service. You can also rent cars, jeeps, motorbikes or bicycles to move autonomously around Corfu island. Here in Sidari you can find many kinds of local shops like supermarkets, pastry shops, jeweler’s shops, tour operators and tourist agencies. For the night you can choose between traditional restaurants or international cuisine and then you can drink a cocktail or dance in a disco club till late. Moreover many tourist shops are open till late in the night and it can be nice for a shopping night. During the day together with many beach activities, there is the possibility to have an organized tour to the Diapondia islands, to Paxi and Antipaxi, to Paleokastrisa area or to Albania to visit the lonely coast. You can also decide to try a diving experience or a horse riding trip. Sidari is a pretty big village that offers different kinds of accommodation to satisfy any need and suit every pocket.